Whether you are new to the game or a seasoned competitor, knowing basic airsoft gun maintenance can save you time, frustration, and money. Caring correctly for your gun will allow it to last for you years, avoid unnecessary wear and tear, and help you when faced with technical difficulties in a game or competition. Here are easy-to-follow steps on how to clean an airsoft gun. Before you start leaning about maintenance, you should be aware about the common types of airsoft guns by checking out our guide on Airsoftpal. Figure out which gun you have, and learn how it operates. Knowing this information can make it easier for you to troubleshoot when having problems with your gun, and save you money you would otherwise spend if forced to take it to a professional. There are two types of guns most common to airsoft – They are spring loaded and gas-powered.When you pull the trigger on a spring loaded gun, the tension in a spring is released into a BB or a pellet. This causes the gun to release the BB at a high-velocity. A spring-powered gun is limited to shooting single-fire only. When the trigger is pulled in a gas-powered airsoft gun, a hammer inside of the gun will push against the valve in the magazine. This causes the gas to be released into the top portion of the gun, shooting the BB out of the chamber. Airsoft barrel cleaning is easy. If your BB’s are deviating vertically when firing your gun, it is time for a good airsoft barrel cleaning. You only need a cleaning rod and paper towel to do this. If you are having a problem with your gun misfeeding or jamming, the first thing you can do to troubleshoot is to lubricate your gun. Start by removing your magazine and fire your gun in semi-auto mode a few times to make sure it is free of BB’s. Flip the gun upside down and spray silicone oil into the hop. Leave it upside down for a few minutes to let the oil settle. If the gearbox needs to be lubricated you need to remove the motor, locate the small hole at the bottom of the gearbox, and spray the silicone oil into it. Just like the hop, leave it upside down for a few minutes to make sure all of the oil seeps in. In caring for your gun you will want to use the proper tools. Proper fitting Phillips and hex wrenches will keep screws on essential parts of the gun from stripping out. You may pay more in the long run by purchasing inexpensive tools that end up wearing quickly and ultimately- breaking. They can also damage your gun. Airsoft megastore do a pretty awesome selection of maintenance kit. Hex drivers– Hex head fasteners can be found in almost every airsoft gun. They range in sizes and it is important to find out what the corresponding size is for your gun. Nut drivers– This is not necessary for all guns but can be used in securing the piston head to the piston. Hand tools– You may need to charge the battery connector to your favorite style or re-wire an AEG. In such cases, you’ll want to have pliers and wire cutters on hand to handle it. Sharps– Picks can help provide you with easier access to hard to reach places. Knife – A hobby knife can assist in carving plastic pieces. Greases and oils – Keep a thick grease to lubricate your gear sets. Lithium grease can easily be found at most hardware stores and works well for this. For rubber components such as o-rings and hop up bucking, a silicone oil is commonly used. Toolbox– Keeping track of your things will make it easier for you to more effectively address your problems. It will also save you a lot of money since you will be less likely to misplace your tools. Depending on the type of gun you own, magazine care will vary. If you have an electric or spring airsoft gun, make sure you empty the magazine completely after each use to preserve spring strength thus, preserving the shelf-life of your gun. If you have a gas airsoft gun, leave the magazine pressurized. Adding a drop of lubricant on the internals will help keep all components intact. When you expel gas from the gun, do not use the release valve. This will cause the o-ring to freeze and can cause gas leakage in the future. Jams can happen for many reasons. Excessive dirt or debris inside of the barrel, dirty or deformed BB’s, an accumulation of dirt in the magazine, damaged nozzles, or a damaged hop can all cause the gun to jam or misfire. If the gun is jammed, you need to troubleshoot the problem immediately to prevent any damage. Turn off the hop up, insert the opposite end of a cleaning rod into the barrel, turn the gun upside down, and push the BB back into the magazine. If that doesn’t solve the problem it is a good idea to take the gun to a professional. Leave a small amount of gas in the magazine- this will keep the o-rings lubricated when the gun is not being used for an extended period of time. Make sure you clean AND lubricate your airsoft gun every 1 to 2 months after every game or match. Avoid weakening the recoil spring by making ensuring the slide is not fully retracted for long periods of time. Avoid weakening the follower spring by emptying your magazine before letting your airsoft gun sit for a while. Don’t release all of the gas in the magazine by pressing the release valve. This will lead to permanent leakage caused by deformed and frozen o-rings. Do not slam the magazine into the gun. The mag lips and nozzle in the slide will break as a result. Your gun will then misfire. Don’t operate an airsoft gas gun in cold weather as this hinders performance. Don’t rapid fire- it will cause the o-ring to freeze. 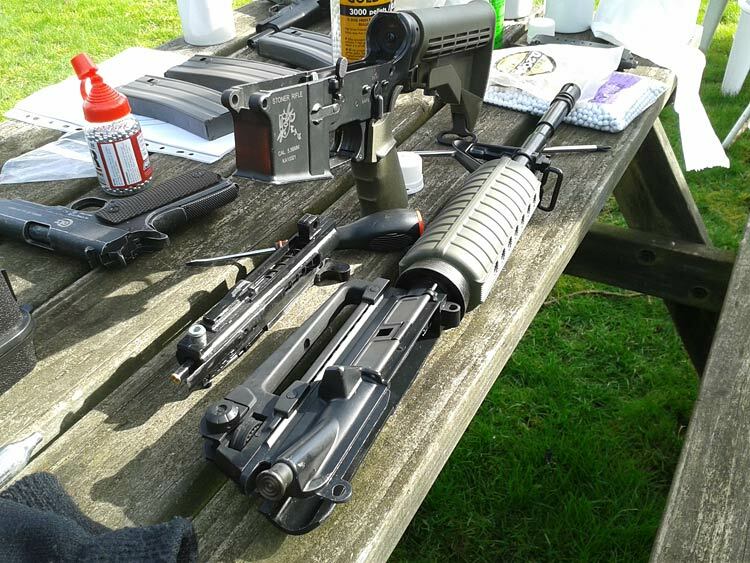 While learning how to clean and maintain an airsoft gun may sound intimidating and time consuming, it’s actually very simple and helps to ensure that your weapon will be performing at its highest level, lasting you for years to come.